Osteoporosis is often called a silent disease because bone loss occurs without symptoms. People may not know that they have osteoporosis until their bones become so weak that a sudden strain, bump, or fall causes a hip to fracture or a vertebra to collapse. 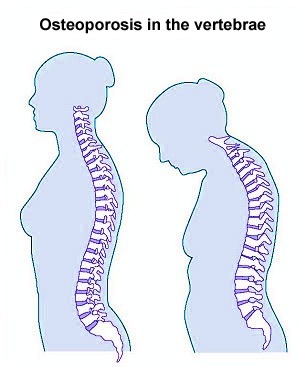 Collapsed vertebrae may initially be felt or seen in the form of severe back pain, loss of height, or spinal deformities such as kyphosis (severely stooped posture).Osteoporosis is often called a silent disease because bone loss occurs without symptoms. People may not know that they have osteoporosis until their bones become so weak that a sudden strain, bump, or fall causes a hip to fracture or a vertebra to collapse. Collapsed vertebrae may initially be felt or seen in the form of severe back pain, loss of height, or spinal deformities such as kyphosis (severely stooped posture). Osteoporosis can happen to any of your bones, but is most common in the hip, wrist, and in your spine, also called your vertebrae. Vertebrae are important because these bones support your body to stand and sit upright. See the picture to the left.